It’s been a busy week for Sussex stars playing overseas including some notable performances from former Roffey and Horsham players. 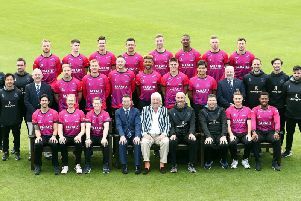 Former Christ’s Hospital pupil Stuart Whittingham was in action for Scotland against Ireland and the UAE in a tri-nation one-day series, hosted by the latter. Against Ireland on Tuesday, Roffey’s Whittingham made one at number 11 and bowled 7.5 wicketless overs for 44 runs as Scotland were defeated by six wickets. Against the same opposition on Thursday, the local lad took 3-58 from ten overs as Ireland racked up 331-6. Scotland ultimately fell 25 runs short with Whittingham not out on three. Scotland recorded their first win in the tournament on Sunday against the UAE. After being set 250 for victory, the UAE were dismissed for 218 with Whittingham taking 2-35 from nine overs. Jofra Archer, who featured heavily for Horsham in the Sussex League in 2016, took to the field three times for Hobart Hurricanes in the Big Bash League in Australia. On Monday, against Brisbane Heat, Archer picked up 2-32 as they cruised to a six-wicket victory. On Wednesday, the Hurricanes travelled to Adelaide to take on Jason Gillespie’s Strikers. Archer’s 3-27 included a superb display of death bowling as he conceded just seven runs and took three wickets from his final two overs. Chasing 188, the Hurricanes came up 12 runs short, with Archer left unbeaten at the crease on four. The Hurricanes made 167-5 batting first against the Scorchers in Perth on Saturday, with Archer (three) again not out. Sussex team-mate Tymal Mills took 1-25, while Archer took 1-31 - including another spellbinding run out, but they lost by five wickets. The Hurricanes are well-placed to qualify for the semi-finals with their final game against Melbourne Stars this Saturday.